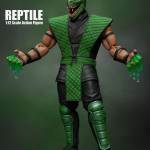 Reptile comes from a realm once known as Zaterra which was mysteriously destroyed ages ago. 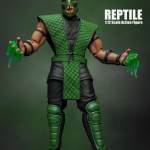 he is the last of the Reptor race. 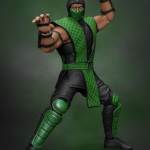 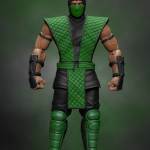 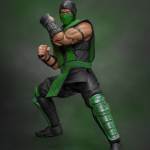 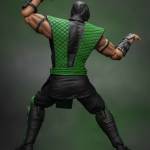 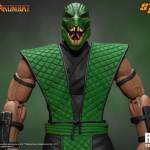 Shao Kahn has enlisted Reptile into his forces and makes use of his stealth and skills as a spy for his army. 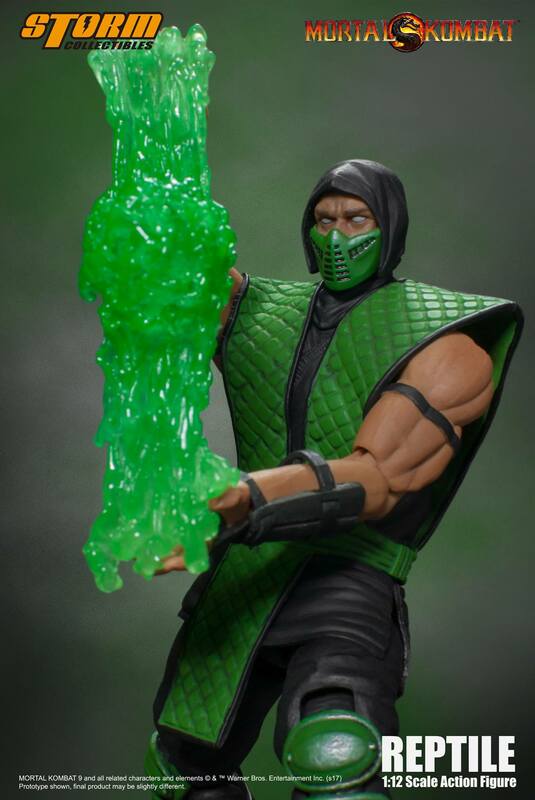 Reptile’s famous special attack are Acid Spit and the Force Ball. 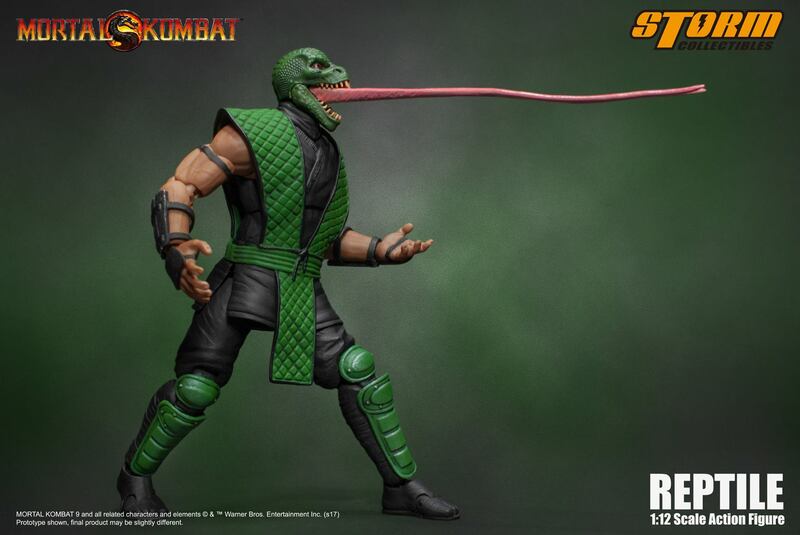 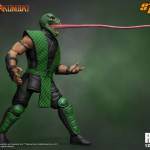 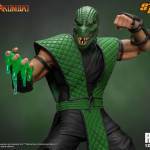 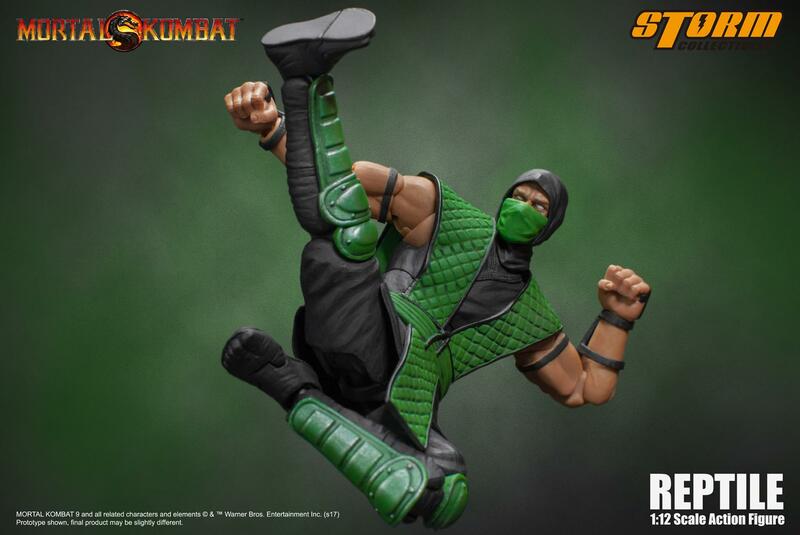 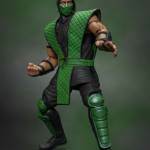 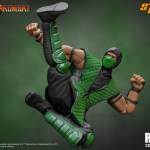 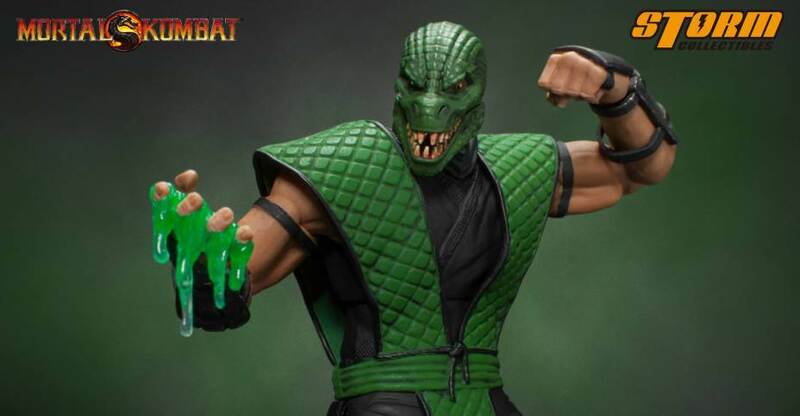 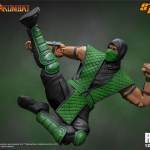 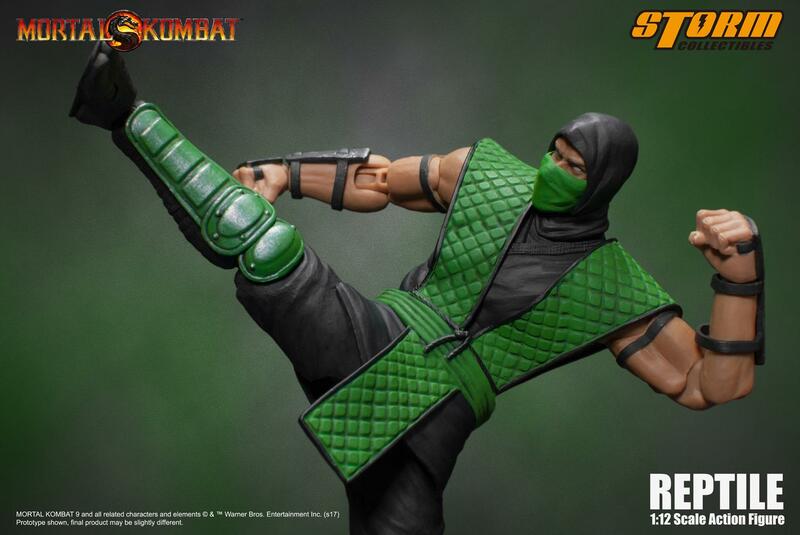 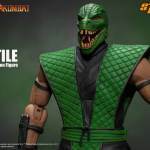 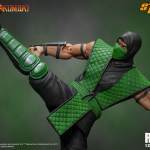 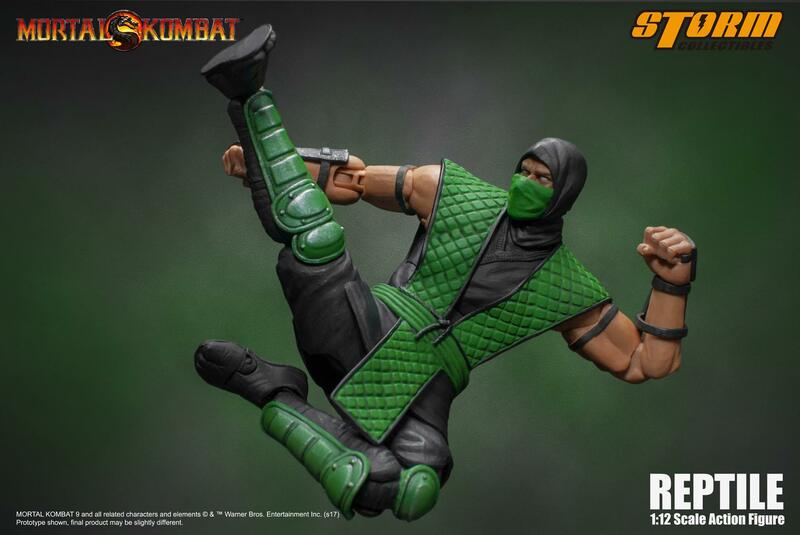 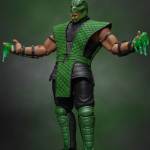 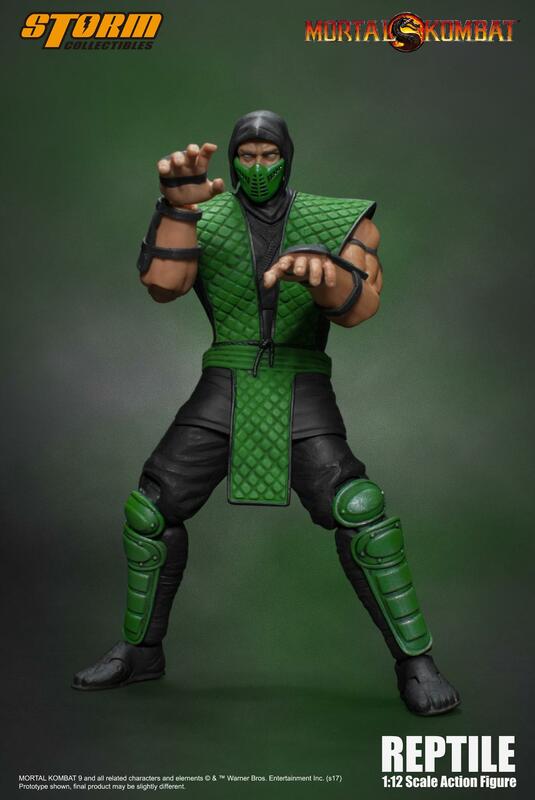 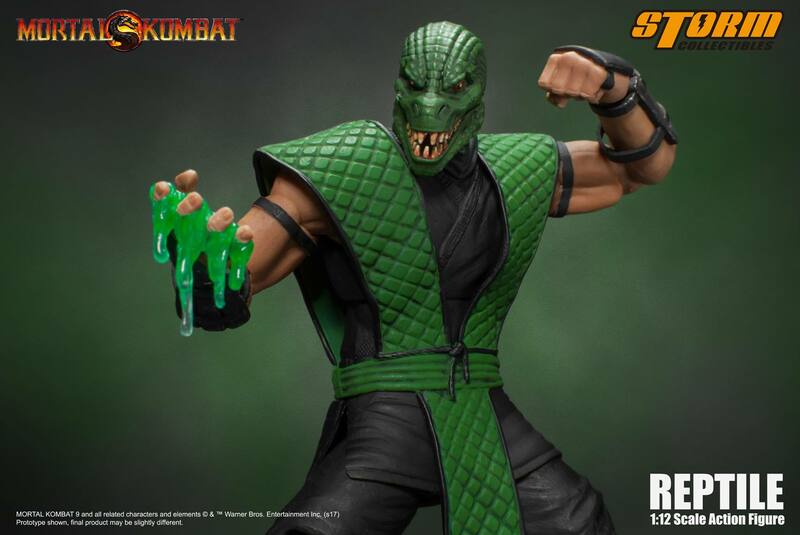 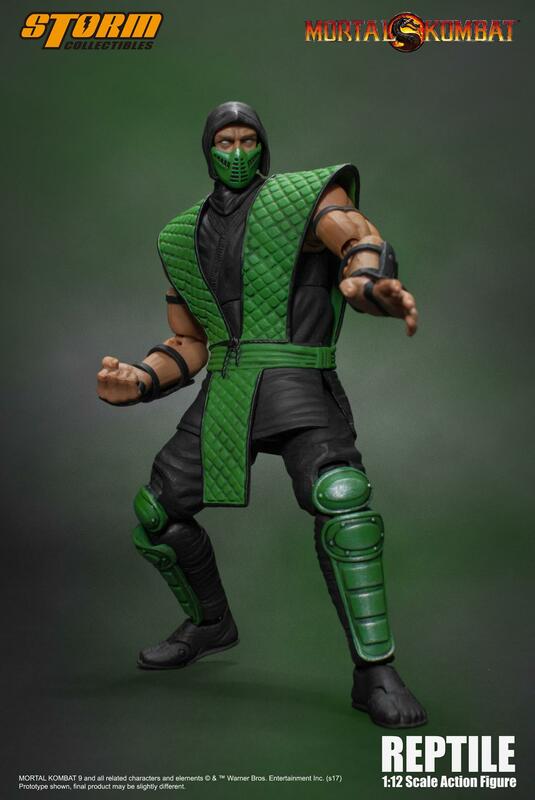 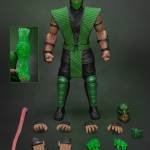 The Reptile Figure is due for release in the third quarter of the year. It’s priced at $50 and can be pre-ordered direct from Storm Collectibles. 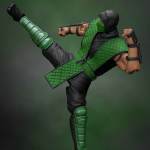 See all of the photos after the jump. 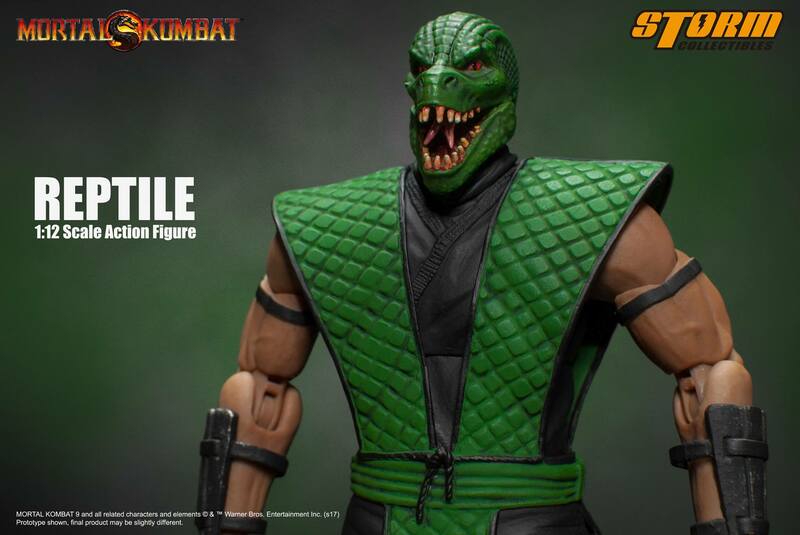 Reptile looks exactly like I expected. 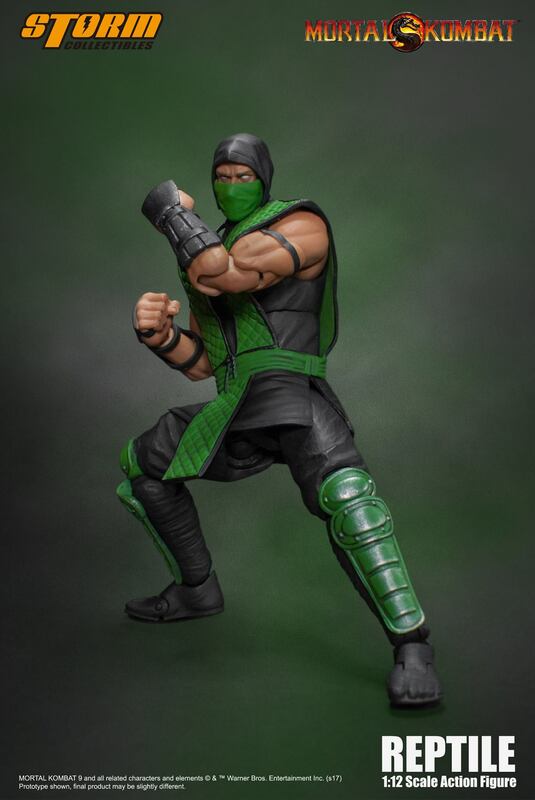 I know they can get plenty of mileage out of the ninja body, but I'm really looking forward to the cyborg ninjas like Smoke and Cyrax. 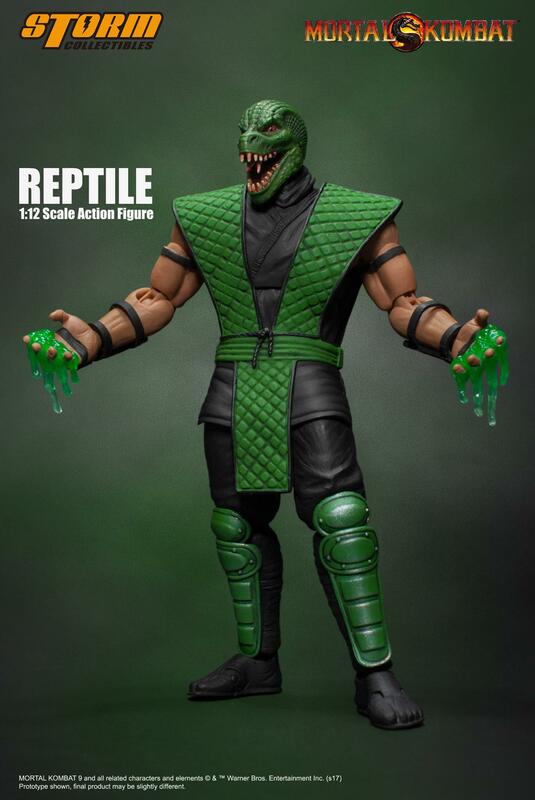 Reptile looks awesome, easy purchase! 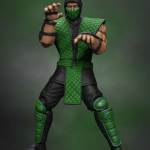 I hope they move on to some other characters soon. 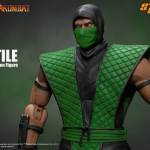 I kinda figured Reptile would be one they could just keep in their back pocket for a release or two instead of just hit those 3 up as far as non-boss characters go. 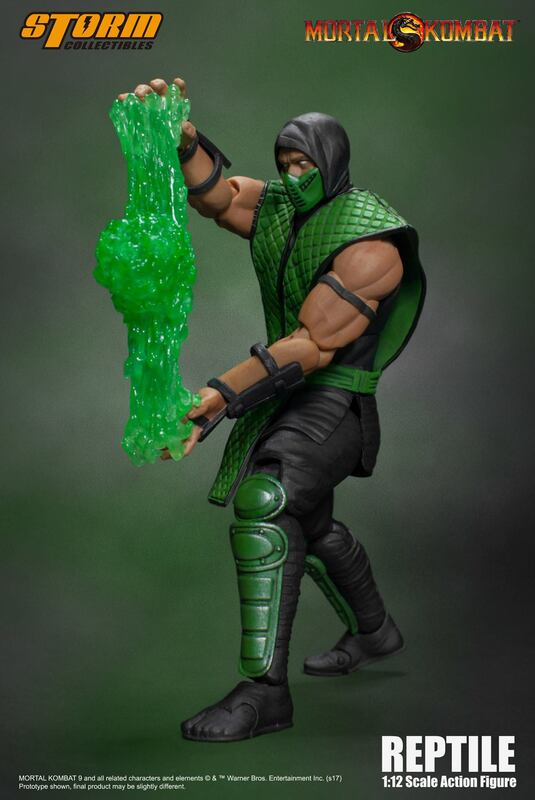 Yeah...the shipping was brutal, that's for sure. 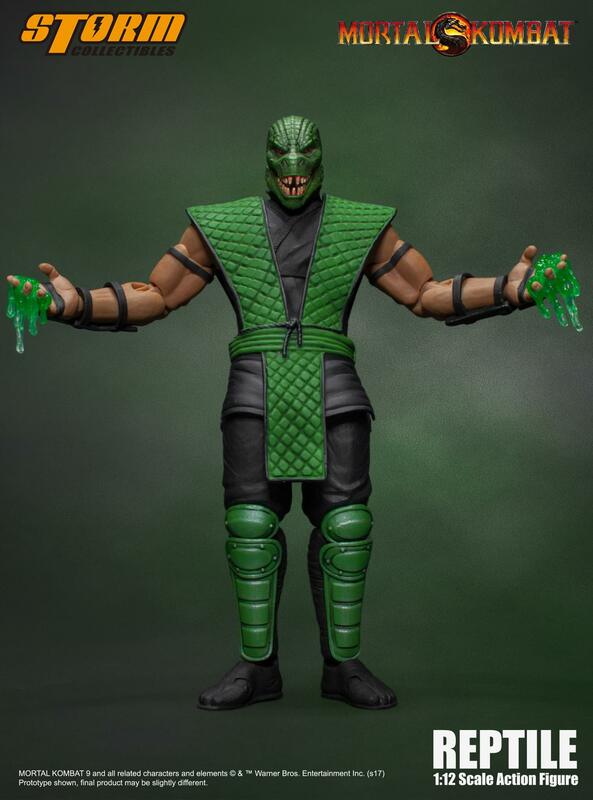 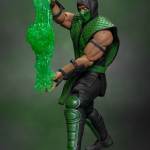 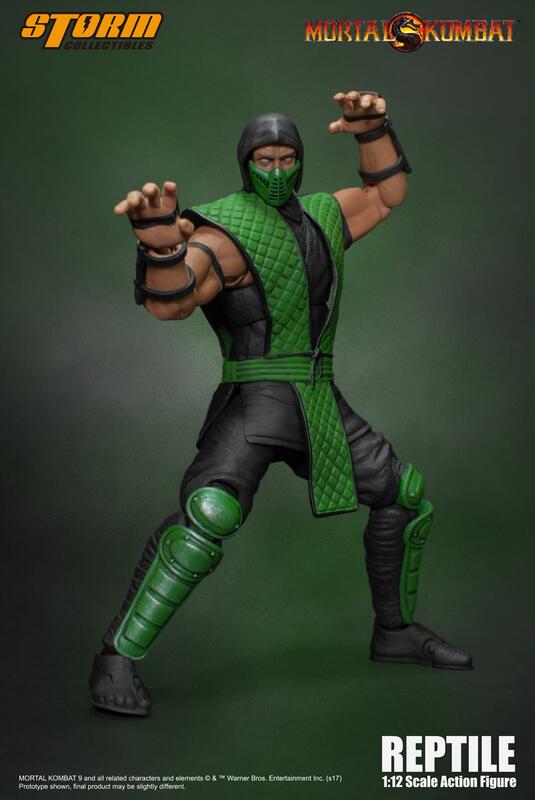 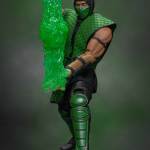 I can't wait to get this guy in hand, especially after the regular MK9 version was cancelled by Jazwares (although we did get the smaller, 3.75 version, the crappy retro 4 pack version and the X-ray version.) 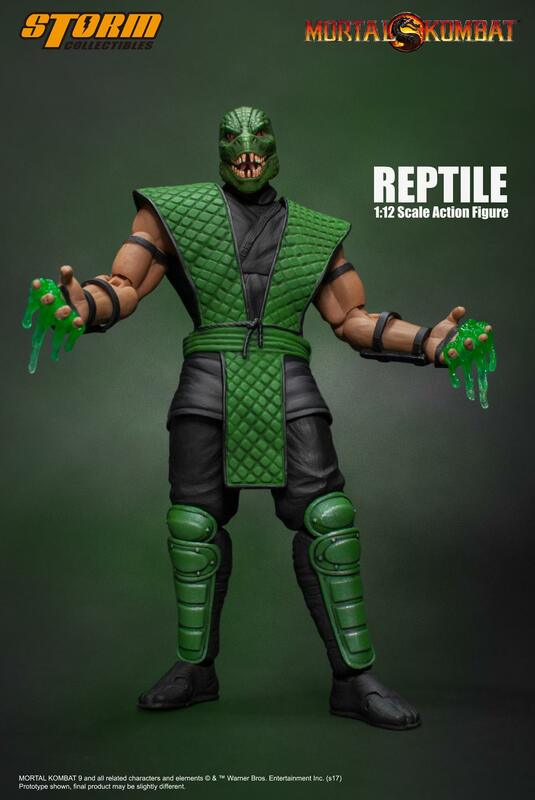 Hopefully it won't take as long to get in hand as it is their M.Bison, which it feels like I pre-ordered an eternity ago. 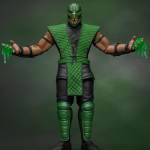 I watched a video review with a fellow that said he asked them about their future plans- seems like their invested in giving this line some legs (not like anyone goes into it saying- let's make one wave then cancel it- lolz) but it's nice that their plans are to keep making new figures. 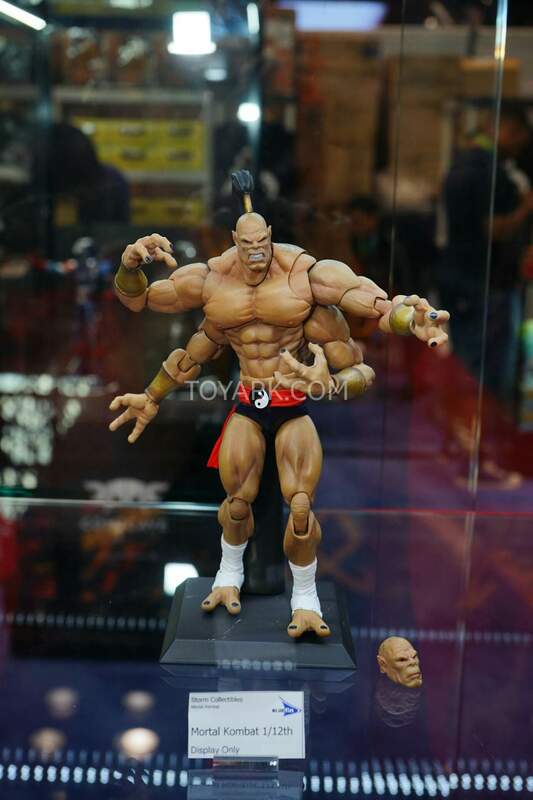 What I want to see them tackle is Goro- he would be massive! 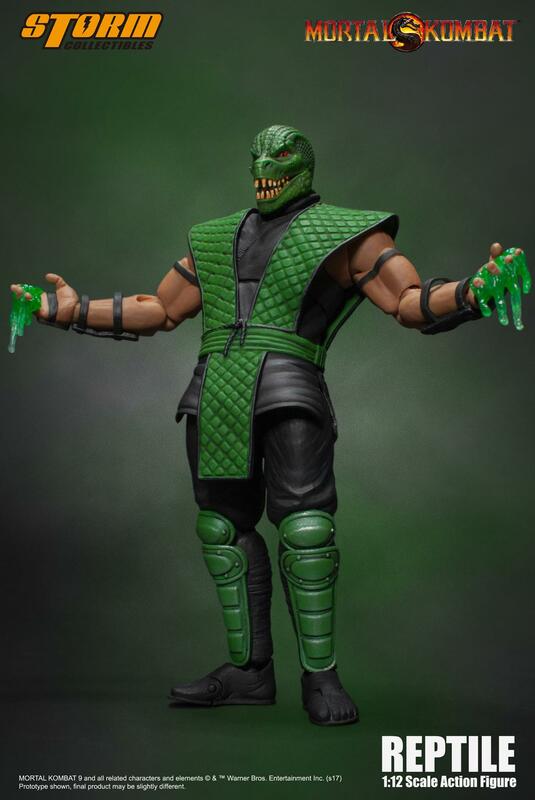 Could go with BBTS? 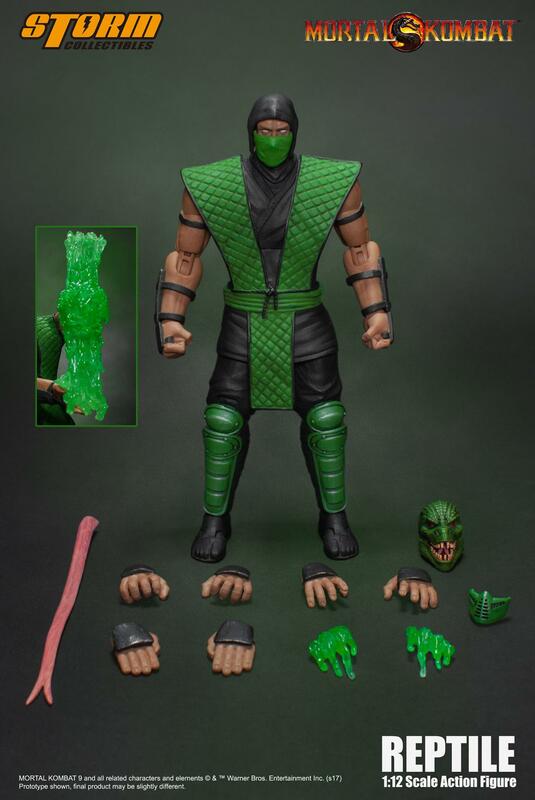 Only a few bucks to ship and they got the private warehouse. 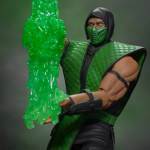 Yeah I have both Sub-Zero and Scorpion on order there, the shipping doesn't go much after one item, it'll probably be $9 total for both for me. 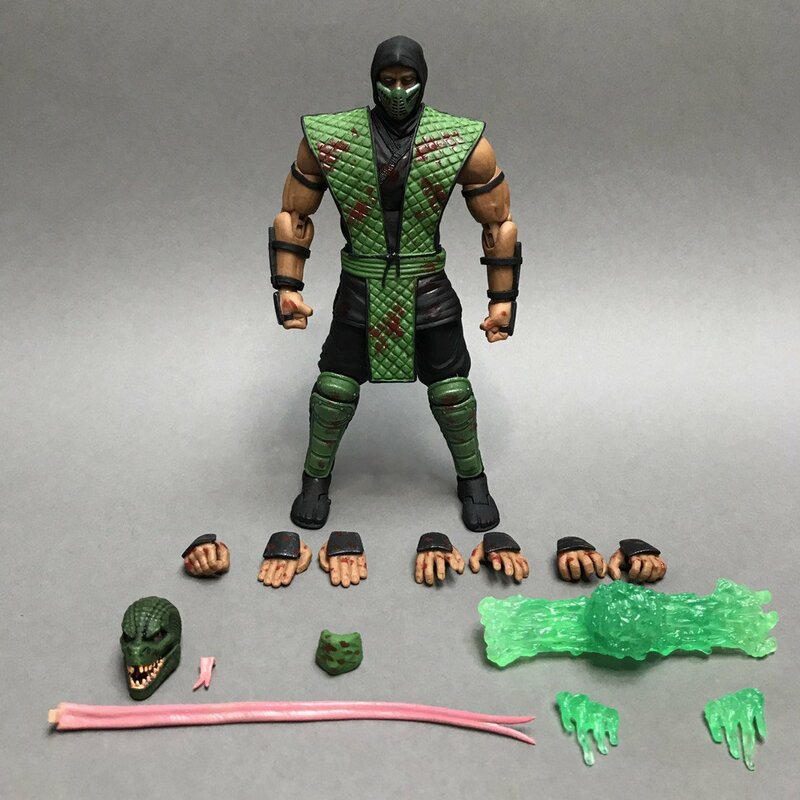 the ninjas....these are things i'm hoping one day i can pick up from someone one day who doesn't want them anymore...for cheap.. 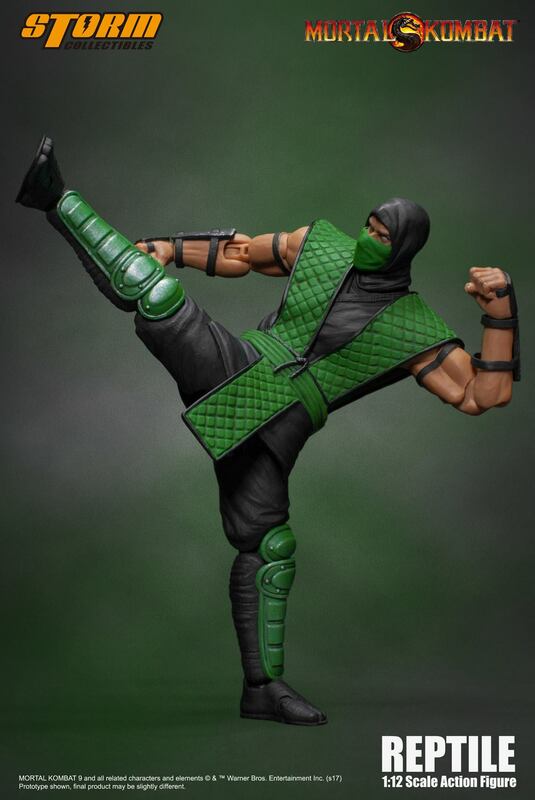 It would be cool if they sort of gave each ninja figure some form of uniqueness to set them apart beyond the color scheme. 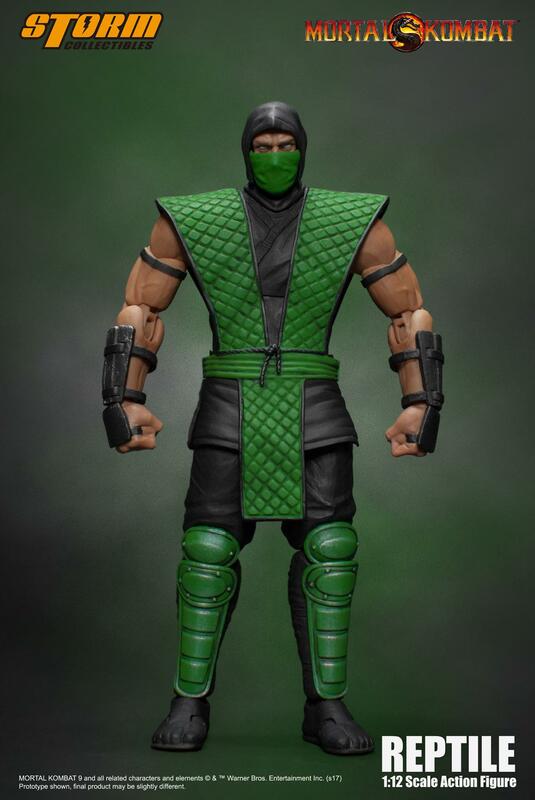 Like maybe a difference in the face mask design, or the pattern on the tunics(like how there's a difference between the more cloth-like tunics and the padded ones from Ultimate/Trilogy). 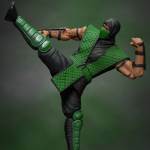 But I know that wouldn't be faithful to the game since the early MKs all featured the same actor in the same costume performing all the male ninjas. 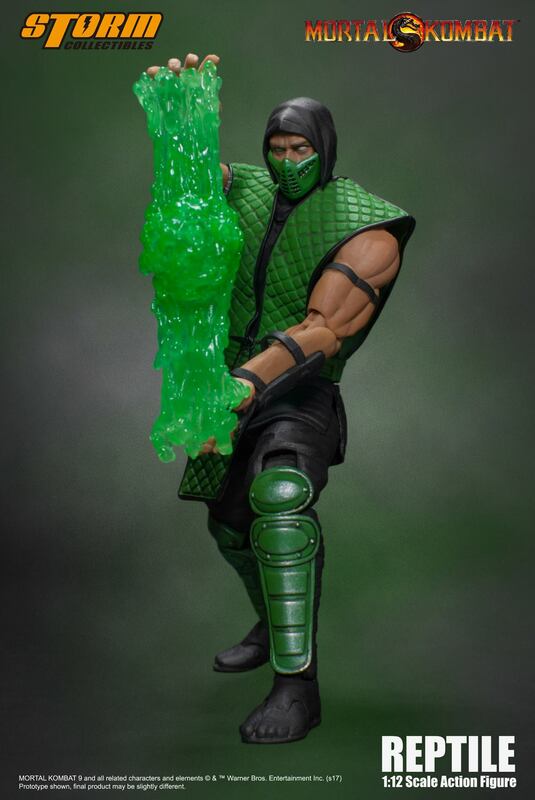 Heres hoping shiva isnt far behind! 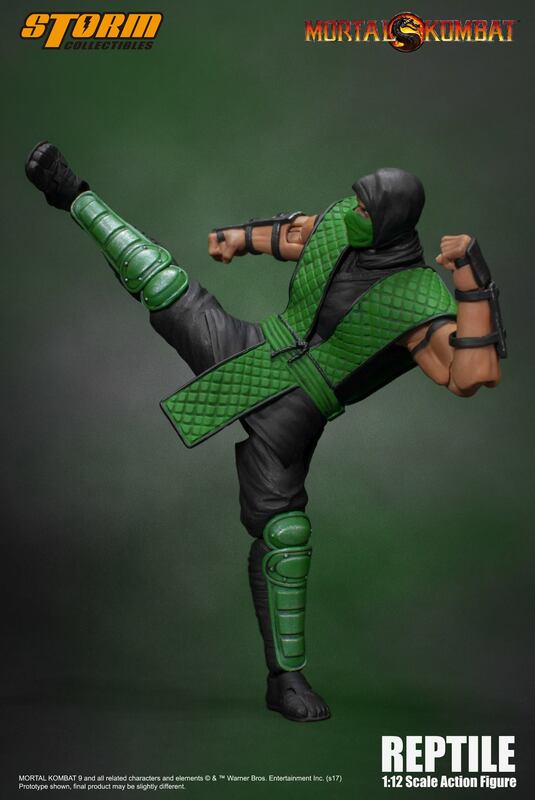 Hope the new mk mileena outfit gets made next, and with removable veil. 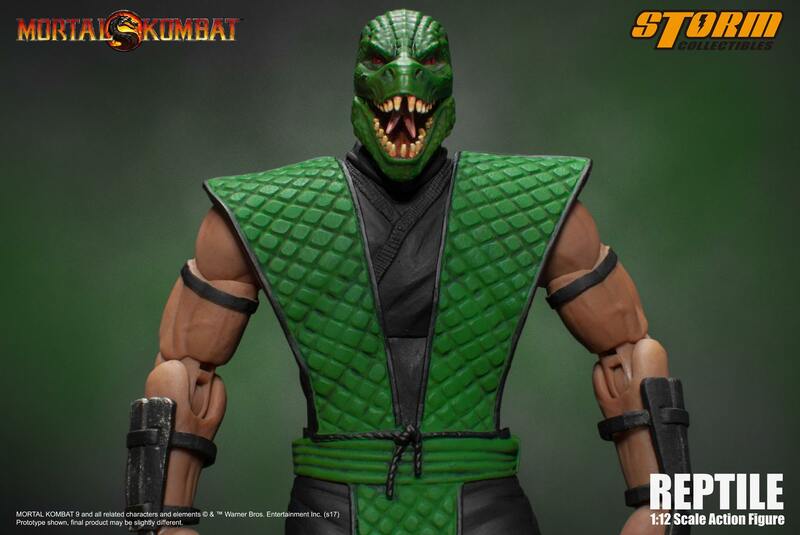 Maybe its just me but i love her unmasked. 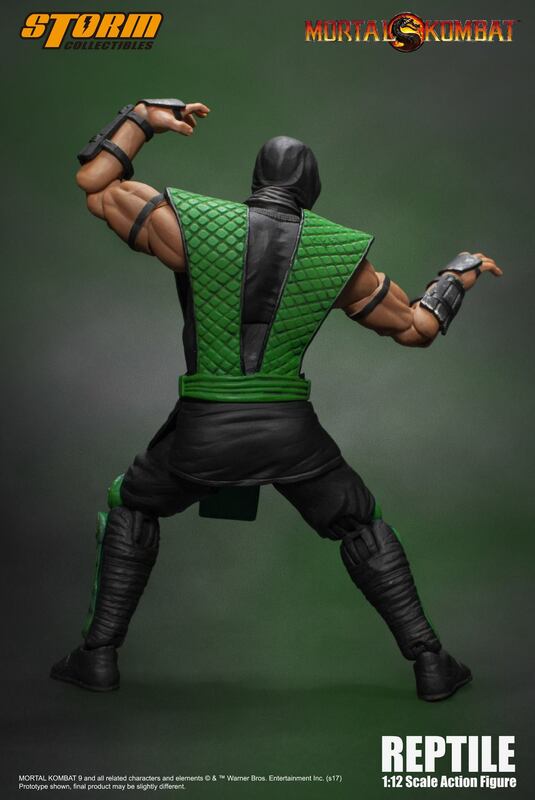 Not just you, but me too.